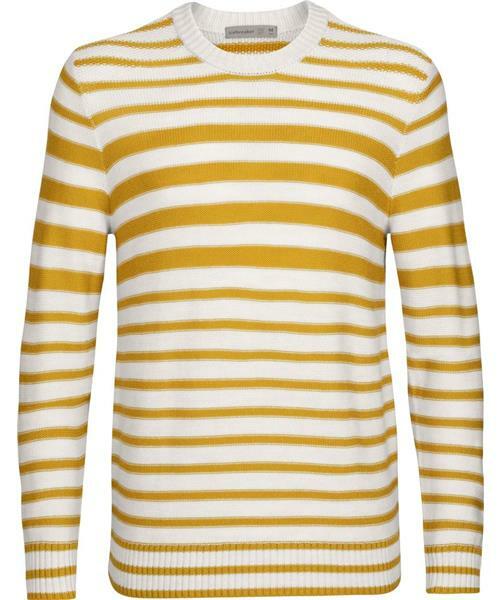 Waypoint Crewe Sweater - Mens is rated 4.4 out of 5 by 11. Rated 5 out of 5 by DHarris from Great Sweater Just like other icebreaker clothing this sweater is comfortable and regulates temperature well. It is a bit smaller than I anticipated - but fits well as a second layer over a t-shirt - it is a bit too tight to wear over a loose long sleeve shirt. To be fair my size is usually right on line between small and medium so it is always a gamble whenever I buy clothes without trying them on first. The quality is very good and it never seems to need washing. It is especially excellent paired up with an oasis short sleeve! Rated 1 out of 5 by swimmy from Threads coming loose after 3 wears and 1 wash I really love this sweater. It is everything Icebreaker says it is and performs as you would expect from 100% merino wool. BUT (and this is a big one) loose threads after wearing only 3 times is totally unacceptable for something that costs this much. It's that much more disappointing because i love it so much in every other way. I seriously want to be satisfied with it and can't speak highly enough about its performance when it comes to comfort, breathability, wicking, and regulating body temperature, all while looking really great. But all that is really kinda useless if it's not going to hold up for a reasonable amount of time. Because of this i CAN'T, in good conscience, recommend this product. VERY disappointed overall. Rated 5 out of 5 by vancityrider from Simple and Functional Fits great, feels fantastic and it doesn't make you look like you belong in a barn. So far its held up to everyday use and hasn't pilled or frayed as of yet. I may have to buy another. Rated 5 out of 5 by KBM64 from What I wanted Warm and light weight . Looks good and comfortable. Rated 4 out of 5 by Luna from Warm as toast! This sweater was the gift du jour for Christmas this year. Both my kids hand long arms and this sweater handled that issue with ease! I bought myself one! Warm; dress it up or down; unusual color for Icebreaker (and much appreciated!) My ONLY CAUTION is cleaning: I washed it as per instructions and when I laid it to dry, it looked like it had shrunk beyond redemtion. Be patient! IT comes back to life and carries on beautifully! Rated 4 out of 5 by mxa0180 from Coziest sweater I bought this sweater for my husband and I love cuddling up to him in it. It’s soooo soft. He loves it and it fits him well (he’s a solid man at 6’4” and I got him an XL). The only thing was that when washed, it seemed to stretch (rather than shrink) and there was some fraying around the collar from shorter merino threads. Might have been the agitator in our crappy washer. Otherwise it’s great! Rated 5 out of 5 by Sarah768 from Wonderful! This is a great shirt! It fits well and is very flattering. I do think it is overpriced for what it is - there are a few spots where I think it could easily snag. I am most likely going to return based on price point alone. Rated 5 out of 5 by Simon18833 from Sweater like no other Most confortable sweater I’ve ever worn. Fits perfectly. I’m almost always a size L and this one fits like a glove. A bit longer on the waist but it’s perfect for this style.